We nowadays see a lot of hardware using an STM chip. There is a very handy tool available which is on many pi images already, but what if you want to use it on windows 10? 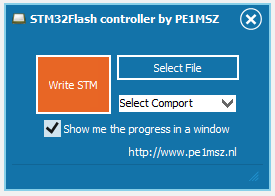 I created a small tool that creates the commands and executes them on stm32flash. Just select your file, your comport, and press upload. Please not in some cases you do need to activate the bootloader in the hardware. In that case just make the boot0 high, and reset the unit. The DVMEGA-cast (formerly known as myDV-cast) can be put in bootloader mode by pressing the volume-button in, and powercycled the unit.